Registration for the State Meet is done by using the spreadsheet available below. Coaches or team managers should download the form and enter their athletes. The final spreadsheet is the sent to the attention of John at john@performancetiming.com. Entries are due by Monday, February 4 at Noon. Cost per skier is $35. This covers both days and the t-shirt for the athletes. Coaches may purchase t-shirts for $10 each. Please indicate the quantity needed in the spreadsheet. The meet is open to non-team affiliated or independent skiers from Wisconsin. We want to encourage the growth of the sport and welcome skiers who may not have a team in their immediate area. Hopefully it will lead to the development of more teams. These skiers can use the team registrations spreadsheet and follow the same submission instructions. Please feel free to contact anyone on the race organization committee for more information on forming a team in your area. There is a provision for guest skiers for out-of-state teams this year. If you are interested in this, please contact john@performancetiming.com for more details. All awards will be presented at the venue. The plan is for them to be outside assuming weather conditions cooperate. The awards will take place at the conclusion of each event on both days. T-shirt sizes must be included with the final team submission. Please note the sizes available below. Sizes available for the athlete t-shirts are XS, S, M, L, XL and 2XL (+$2). Coaches may purchase t-shirts for themselves at $10/each. Please include your order with your team submission. Skiers returning that placed in the top 20 in the 2018 State Meet. Top 4 skiers from each Conference Meet. Seed Group B: Using coach self-seeding, skiers who would be expected to place in the top 40 who are not included in the A seed group. Seed Group C: Skiers who are expected to finish in positions 40 to 70. Seed Group D: All remaining skiers. Groups B, C and D are all coach self-seeded and are their seeds are included in the registration submission. 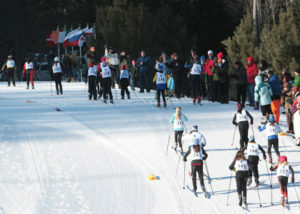 Middle School skiers are to be seeded based on coach’s discretion. Use the criteria below as your guide. A – Expected top 25% finish. B – Expected top half of field finish. C – All other skiers.